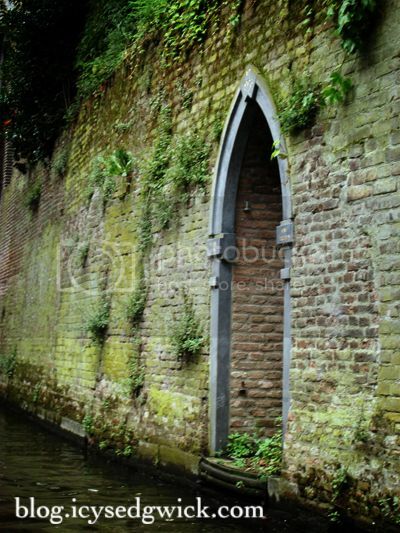 I tiptoe down the steps towards the arch in the wall, the stairs slick with wet leaves. A fine mist of rain clings to my hair and gown, yet I do not fear the moisture in the night air. Water is not my enemy. I stand on the edge of the step, clinging to the stone arch, and peer into the gloom. Sten's boat will cut through the darkness and he will lift me down onto a seat. We will spend the night quietly traversing the canals of the town, sliding beneath the houses built over the water. I will sing softly in the tunnels, my song encouraging the water to glow to light our way. Footsteps squelch on the steps behind me and I turn to see Sten. His face is white in the darkness, and he is not alone. Another man stands behind him and my blood runs cold when I recognise him. His sharp features and dead eyes can only belong to Ward de Ville, Chief Inquisitor. I know that my romantic trysts with Sten have been uncovered, but there is a greater threat than the shame of being an unchaperoned woman. De Ville would not be here otherwise. "So this is her?" De Ville looks me up and down as though I am something foul and abject. He does not hide his disgust, but I can smell his fear beneath the bravado. Sten nods, and refuses to meet his gaze. I wonder how much Sten will receive for my bounty, and if he will enjoy spending such newfound wealth, knowing he was paid for my death. "Nothing to say for yourself?" asks De Ville. "Nothing I would care to say to you, at least," I reply. I see no profit in playing innocent, in asking Sten what he means by bringing De Ville here, in pleading for my life or denying whatever charges De Ville chooses to throw at me. Such grovelling is not the way of my people, for we are as strong as the tides. Without a word, De Ville steps forward and pushes me into the water. My gown grows heavy, and the canal's cold fingers drag me down. They expect me to struggle, but I am caught in their quandry. If I sink, I am innocent, and if I surface, I will be burned. I hold myself in the murky depths, waiting until the men are satisfied of my 'death' and leave the stairs. My anger burns so fiercely that I worry it will make the water churn and boil around me. I hoped this place would be different, that the people would be welcoming and appreciate my gifts, instead of fearing them. But the current of hatred runs strongly in man, and I must find another home. Again. And yet. I bide my time in the water, secure that they have gone. Men with poles will return later to find my body, and thus proclaim my innocence, although they will find nothing. I hope that such proof will destroy Sten's conscience, in allowing him to think he condemned his innocent love, but I cannot let it rest. I follow the canals beneath the houses to find that of Sten. I pull myself up onto a narrow landing, where a service door leads directly into the tunnel. I heave it open and slip inside. Sten will have quite a shock in the morning - perhaps the greatest, and last, shock of his life. Every now and then you come across a book and it's literally the title that makes you buy it. 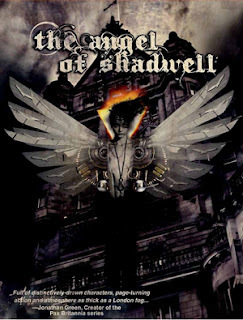 I came across The Angel of Shadwell by Jonathan Templar on Facebook (I think) and being a sucker for all things London, I downloaded a sample for my Kindle. I didn't even read all three chapters - I bought the whole thing after just a couple of 'pages'. To own the truth, I downloaded the full version and started reading on 11 June, and finished on 12 June. It's not the longest book but it's such an engaging read, it's easy to get sucked in. I'd describe it as a steampunk crime caper, in which Inspector Noridel and the faithful Sergeant Crayford are set on the trail of a killer who tears the hearts from his victims. When an aristocrat is slain in such a way, things escalate and Noridel is fighting to keep his job amid scrutiny from those higher up the chain of command. Witnesses describe the killer as being an angel, so what exactly is Noridel chasing? It's not a complicated plot, but it's a compelling one, and that alone keeps you reading. Some steampunk stories can sometimes feel like the steampunk elements have simply been 'bolted on' to satisfy a list of criteria (Cogs and brass? Check. Steam? Check. Automata? Check. Airships? Check.) but in The Angel of Shadwell, the elements are so integral to the plot that the story wouldn't work without them. Beyond that, Templar uses them in a wildly inventive way, and his cast of miscreants reminded me of the more restrained outpourings of China Mieville. Noridel and Crayford are both likeable protagonists, while the uneasy truce between Clock and Flesh (i.e. automatons and people) seems rife with possibilities that I hope Templar explores in the future. All in all, it's a quick read, and highly enjoyable. Five blunt pencils out of five! You can buy it from Amazon US and Amazon UK.